Bucatini with Burst Tomatoes is as simple as it sounds, and if you’re the kind of cook who loves a no-recipe recipe like I do, then I think you’ll be very happy you stopped by. I only wrote this one down as a formality, and because I don’t want to talk myself out of a job here. I love regular recipes, of course, but on busy nights, I’m all about improvising. Bucatini is a hefty tubular pasta that looks just like a thick spaghetti, but with a hollow core. I chose it because the sauce is so light and healthy, I thought it could use the extra oomph of a sturdy pasta. I never want to leave the dinner table hungry, even on improv nights! I am a huge fan of cherry tomatoes because they’re available all year round and they’ll give you a summery fresh tomato experience in the middle of winter. They’re wonderful raw, but when they are lightly cooked their flavor really comes alive. In fact in this dish, the tomatoes are barely cooked at all – just enough so that they burst open and release their juice to make the sauce. I suggest using round cherry tomatoes, and not the pear or oval shaped ones. The round ones burst better, and have more juice inside when they do burst, so they make a richer sauce. When the inside of the tomatoes reach a certain temperature, they expand and their skins split open. 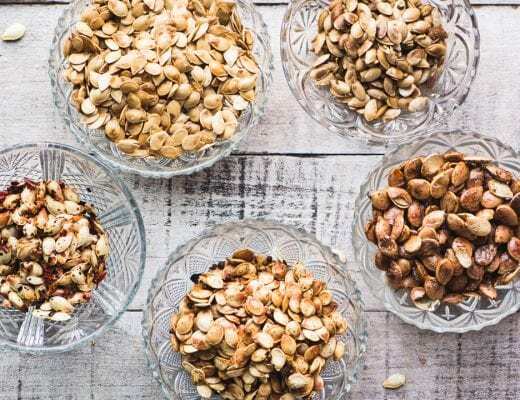 Depending on the variety you are using and how long you cook them, they may retain their shape a little, or they may collapse completely. I had a little of both. You can apply this same formula to lots of different dishes–see my EASY WHITEFISH WITH BURST CHERRY TOMATOES AND BASIL, or, perhaps the simplest of them all, GRILLED CHERRY TOMATO BRUSCHETTA. I start by sauteing a minced garlic clove in a little olive oil. I’m not a garlic lover, I think it can be overpowering, so I only used one clove. You can use two or three… remember, this is a no-recipe recipe, so do as you please. I love all the colors of the heirloom cherries, and since they’re mixed varieties, you get lots of variation in flavor and texture, but definitely use the red ones if that’s what you have. The important thing is a splash (1/2 cup for you recipe lovers) of white wine and some fresh basil. Cover and cook until everything bursts, about 10 minutes, and then toss with the pasta. Garnish with more basil and oil, and some Parmigiano Reggiano cheese. 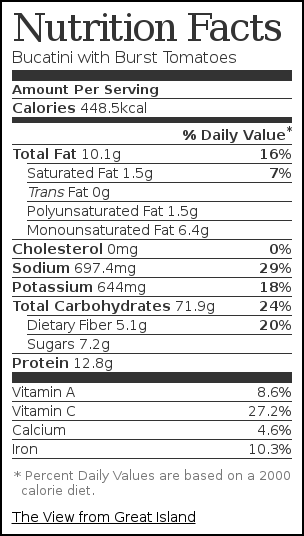 Buy the good stuff for a dish like this where it’s one of a very few ingredients. What’s nice about a meal like this is that you can’t mess it up. What could go wrong with olive oil, garlic, tomatoes, and basil? fresh basil, chopped. I used about 12 good sized leaves, but the amount is not important, go with less or more according to your taste. Save some for garnishing. Meanwhile wash the tomatoes and remove any stems. 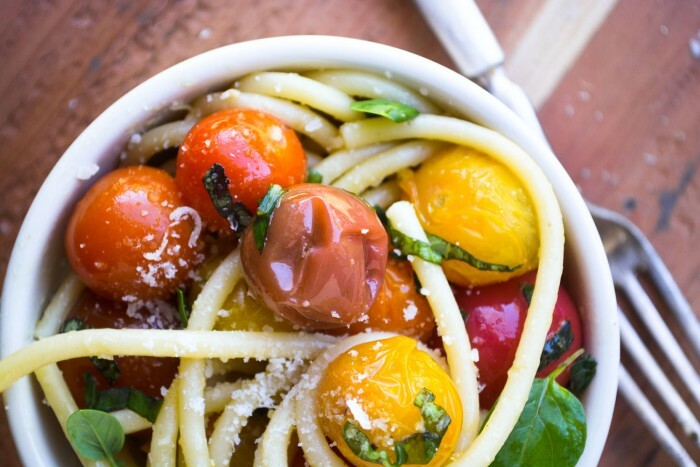 Use any pasta shape you like with these burst tomatoes. I think twisty fusilli would work well to catch all that sweet tomato juice. 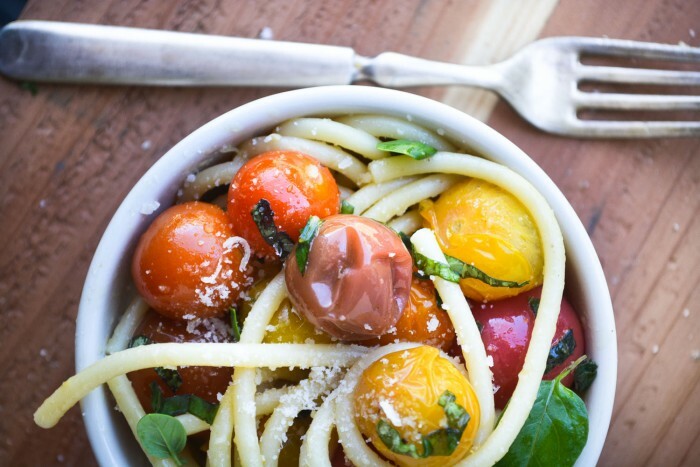 Don’t forget to pin this Bucatini with Burst Tomatoes! I love this dish! So many different flavors at once! Sue, this was a fantastic dinner for my husband’s birthday! I couldn’t find the bucatini pasta so substituted another shape. Added a green salad with blueberries and strawberries and a loaf of crusty bread. I loved this so much I shared on FB and also send directly to my sister who promptly headed for the store to get the ingredients for her meal tonight. Thanks so much for posting. Love, love, love it. I’m so excited to read this Sandi because this was such a beautiful pasta, and it’s just the kind of meal I love. 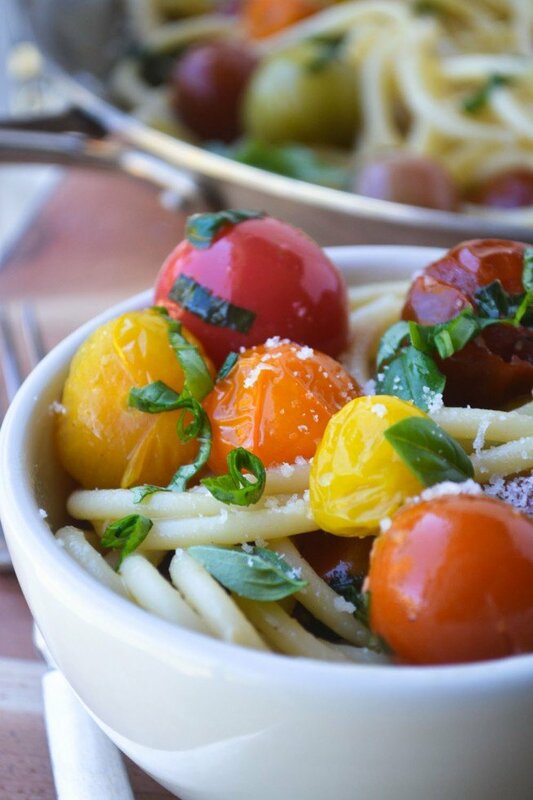 I also love that you can almost always get good cherry tomatoes, year round. Happy Birthday to your hubby! I made this for my husband for the first time a month ago and now he wants it at least twice a week! how lovely! i like your proportion of tomatoes to pasta, and i think it’s safe to say that this is the post beautiful bucatini dish i’ve ever seen! 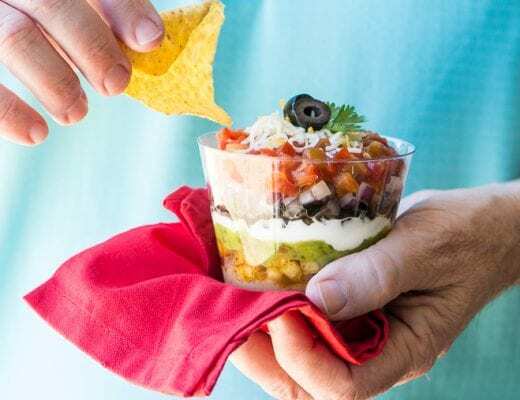 You are right–it is a no recipe recipe. I like it. Dare I admit this is the first I have heard of this noodle. Wow, I am sure this is going to help me be a popular party guest. Lol. I love the recipe. 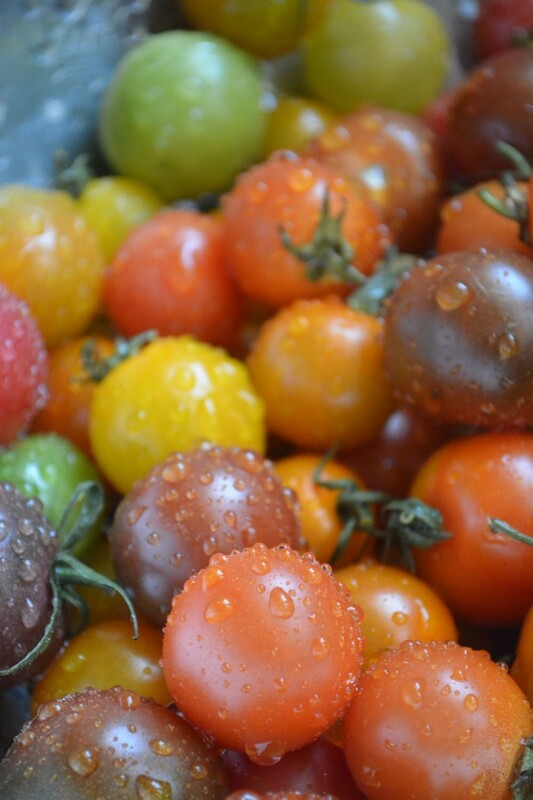 Look at those gorgeous tomatoes! This pasta looks delicious, and I love how easy it is!! This looks so tasty and appetizing with all the colourful cherry tomatoes! I just found your blog and adore it! I WILL be using your recipes on a regular basis. Thanks so much! I’ve not come across that type of pasta… I suppose it’s like continuous Penné. Nice recipe. With pasta, simple is best. Thanks Cro – and yeah, it’s just a thick, hollow spaghetti, I just used it for a change since I happened to come across it at the store, I think it was Barilla, which is my favorite pasta here in the States. 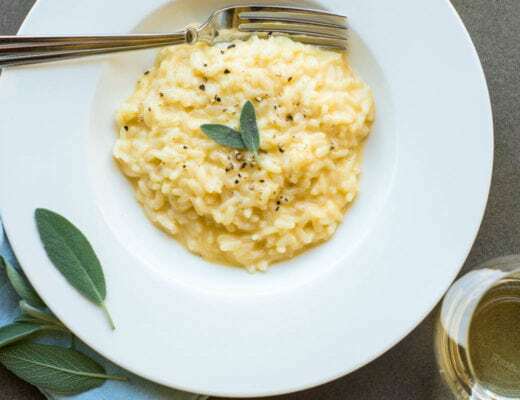 This is my kind of meal – simple, yet so so good! There’s no better way to eat tomatoes! Thanks for your comment, and welcome in! 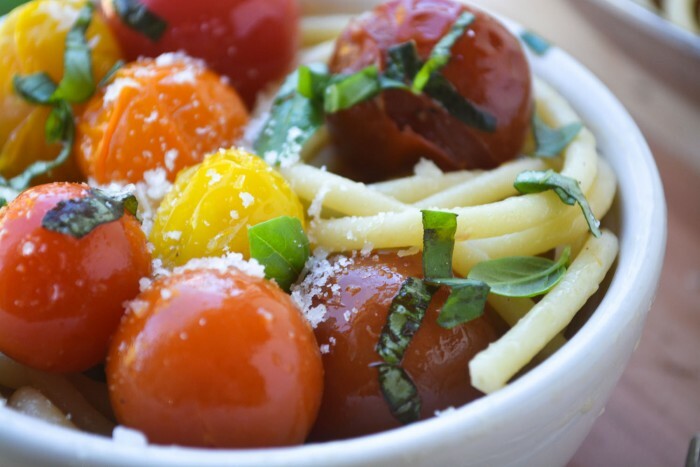 If you are trying to use that many cherry tomatoes every day, then this is definitely a recipe for you. And I love the phrase low effort/high impact, that really does describe what I’m trying to do! What a cool pasta and a wonderful recipe! I’ve never heard of bucatini before – but love everything about it. 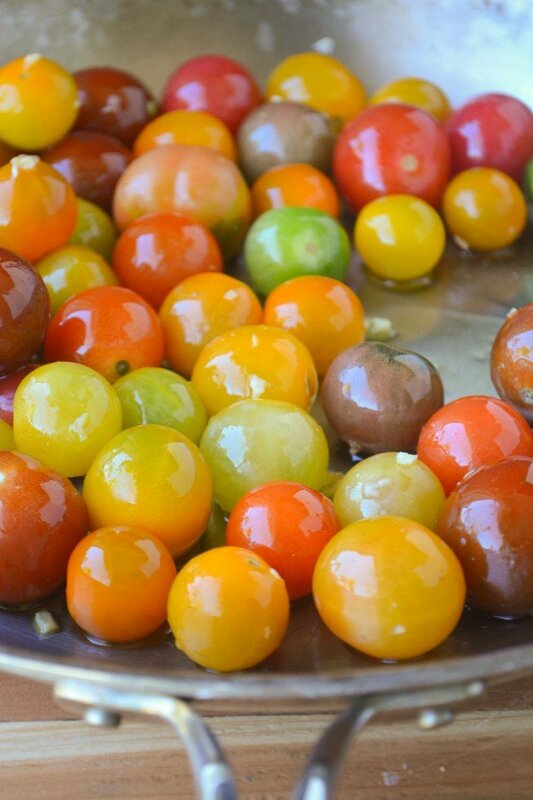 I made a pasta salad last weekend for my grandson’s birthday and used tomatoes like these – they are beautiful and amazingly delicious! Your job is safe with me! Have a wonderful weekend! This looks as gorgeous as I’m sure it tastes! 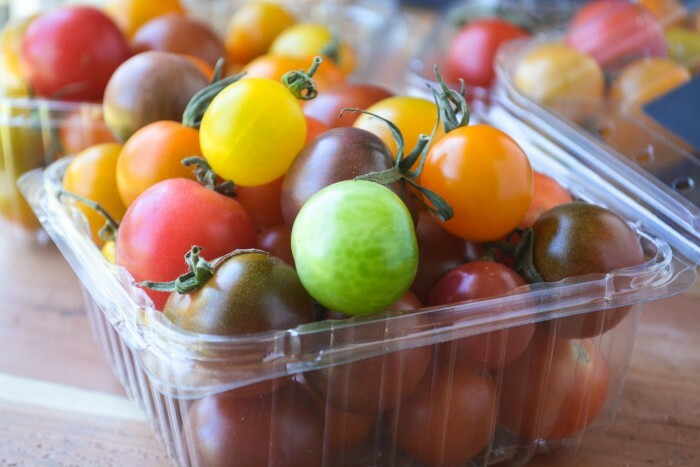 I love those little tomatoes too, such a great reminder of summer in the cold months. I roasted them yesterday and served them with Italian sausage over pearl couscous. So yummy! Thanks for a new way to use them Sue! How pretty! 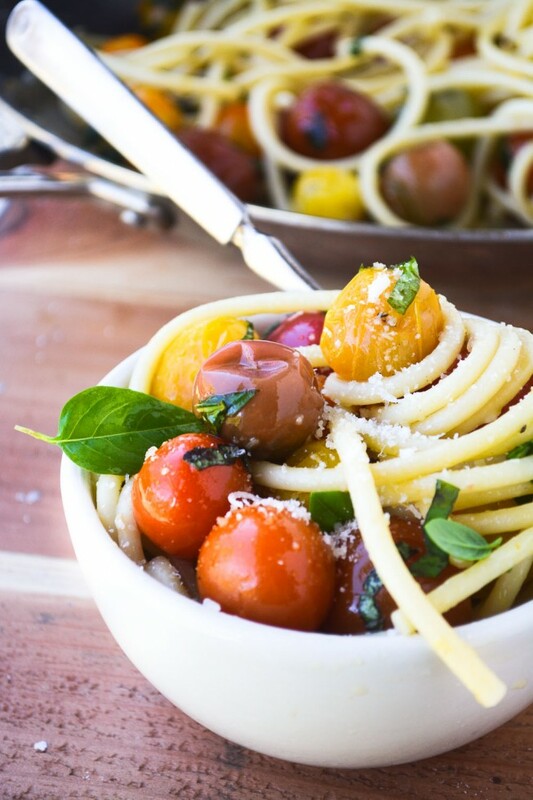 I love fresh tomato pasta recipes like this! I’ll be saving this one to make in the summer when my cherry tomato supply is at its peak. I have been loving the pasta lately and this looks so bright and tasty! I just love this and guess what? I just came home with cherry tomatoes! Those tomatoes are beautiful! This dish looks so flavorful and easy, can’t wait to try it. The colors in those pictures are gorgeous! There’s nothing better than fresh tomatoes off the tomato plant. Last year, we were up to our eyeballs in cherry tomatoes. As cherry tomato plants go, I’m sure we’ll have even more than we did last year. No complaints here! Have you ever grown the teeny tiny ones, I think they’re called candy tomatoes? omg they are incredible! thanks Monique, I was a little worried about how the ‘burst’ tomatoes would read in photos!